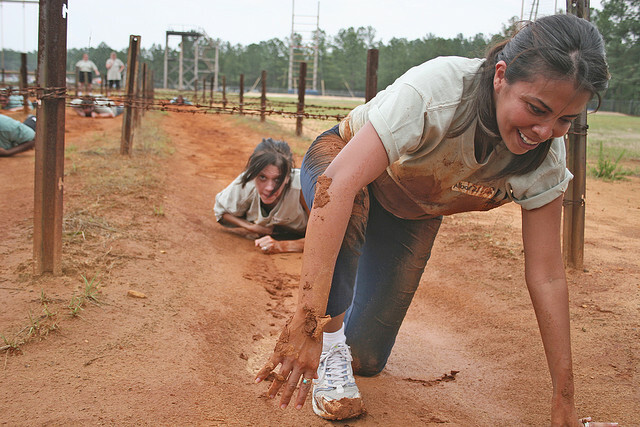 Army spouses experience "Soldier for a Day" training at Ft. Bragg. Happy Military Spouse Appreciation Day! Writer and military spouse Mary Ann Eckberg shares what she thinks is awesome about being a military spouse. Happy May! This time of year always brings me such joy! Warm spring sunshine dances through my windows. Cheerful birds sing vibrant melodies while building nests on crooked tree branches. Neighborhood flowers compete for “best in show” with colorful blooms. An added bonus? The month of May celebrates military spouses! These men and women lead spontaneous lives filled with busy schedules, often far away from their hometowns and family ties. I am honored to carry the title of "military spouse," and want to share a few reasons why being a military spouse is awesome! Countdown of The Top 5 Reasons Why Being A Military Spouse Is Awesome! No matter if their hometown is in the middle of nowhere or in a bustling metropolitan area, it’s a place that has a special meaning. When gathered with others, a military spouse usually brings along great stories to share about where they hail from. It’s enjoyable to hear the descriptions of the places they recall, the adventures they’ve had there, and the people that have made it so memorable. In addition to being an entertaining topic for conversation, sharing good stories about where they’ve grown up helps keep a military spouse from being homesick, especially when stationed far away. Growing up, my brothers and I watched a lot of old Western movies. With that in mind, I used to dream of living in Texas, picturing cowboys on horseback and hometown cafes with gingham tablecloths. In reality, living in Texas is quite a bit more modern than that! But what a thrill when we were stationed in a location I had once dreamed of. Other military spouses have fulfilled dreams of worldwide travel with assignments to England, Germany, Italy, Turkey, Japan and other far reaches of the globe. The stories they share are full of adventures and once-in-a-lifetime experiences. 3. When Military Spouses Gather, There Is an Instant Network! If a military spouse feels comfortable enough to attend an organized spouse activity, they may be surprised to find that they have something in common with almost everyone else in the room. This unifying factor may be as simple as a story from a move--describing the untimely demise of a favorite keepsake, the saga of house hunting from afar, or transitions made easier. If a spouse has the opportunity to gather with others, there is a common bond that is shared, no matter how unique each personality may be. That common bond among military spouses is a valuable gift, as well as a great way to make connections and build friendships. Honestly, think about the daily chores, the meals, the calendar full of things to do. Driving here, there, and everywhere for places they need to be. With everything else going on in life, a military spouse keeps it all together (and then some! ), often while juggling their own career. Why do it all? So that their military member can be at their best. When the military member is recognized for their motivation and enthusiasm, a military spouse does not ask for “credit”. They simply know they play an important part in keeping everything on track and running smoothly! (insert drumroll, please!) The Number One Reason Military Spouses Are Awesome..
1. Military Spouses Prove Their Strength Daily! Military life gives spouses the chance to prove just how strong and independent they can be. They may accomplish great things and tackle big challenges, often without their significant other at their side. Sometimes life simply hands them a “to-do list” and it’s all up to them! Experiences like that help a military spouse learn and grow. As they handle whatever comes up, they may be surprised at how much inner strength they have. Before the busy Summertime schedules begin, enjoy these days of May and take a moment and give thanks for military spouses. Share sincere appreciation for the support and time and effort that these amazing men and women give! Photo credit courtesy U.S. Army Flickr, some rights reserved.